Juice, I love my juice, I make sure I have at least one big GREEN juice everyday. All my juices are freshly made and preferably drunk within 15 minutes of making them to ensure all the vitamins, minerals, amino acids and general good stuff is still active. I owe my juicing knowledge to two people – first my friend Davina who told me all about it soon after I was diagnosed having been a juicing afficionado for quite a few years, secondly is the man himself Jason Vale aka The Juicemaster! He has some great books to get you started as well as all the equipment you’ll need. You can purchase all you need through this link, get 5% discount and help me to make some money for charity. So, GREEN juice. Hmmmm, that sounds a bit weird if you’ve never encountered proper fresh juices before – and I don’t mean those “fresh” juices you buy from the shop – they’ve been heat treated so don’t have the same effect in any shape or form. I used my Juicemaster recipe books to begin with so I knew they would taste great and now I tend to freestyle it with whatever I have fresh and in season. I’ve found that its a little like cooking and coming up with recipes you get to learn what goes with what and instinctively know what doesn’t work. 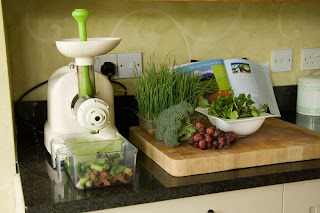 The juicer I use is what’s called a “masticating” juicer (mine is a Matstone 6in1) which enables me to juice wheatgrass as well as all the veggies.There is no way around juicing without a juicer, but if you want to try it out at an “entry”level then a centrifugal juicer such as the Philips Aluminium Juicer is a good place to start. Other Vitamins, minerals, enzymes and amino acids are available in these ingredients!! Itied posting info on Helen Fawkes facebook account, but it was censored.